"Circumstantial evidence, that wonderful fabric which is built out of straws collected at every point of the compass, and which is yet strong enough to hang a man. ... A scrap of paper, a shred of some torn garment, the button of a coat, a word dropped incautiously from the over-cautious lips of guilt, the fragment of a letter, the shutting or opening of a door, a shadow on a window-blind, the accuracy of a moment tested by one of Benson's watches -- a thousand circumstances so slight as to be forgotten by the criminal, but links of iron in the wonderful chain forged by the science of the detective officer; and lo! the gallows is built up; the solemn bell tolls through the dismal gray of the early morning, the drop creaks under the guilty feet, and the penalty of crime is paid." "I knew by induction that the baronet was going to make you an offer: first, because he came downstairs with his hair parted on the wrong side and his face as pale as a table-cloth; secondly, because he couldn't eat any breakfast and let his coffee go down the wrong way; and, thirdly, because he asked for an interview with you before he left the Court." Few people could give the correct answer if asked to identify who is speaking. Nor would guesswork be likely to help. The style of the first extract is reminiscent of Sir Arthur Conan Doyle. However, the playful tone of the second -- and the accurate use of induction, rather than deduction, to describe the reasoning process used -- tends to rule Holmes out as the detective. Other candidates which might be put forward would be Inspector Cuff or Franklin Blake, respectively the "professional" and "gentleman amateur" sleuths in Wilkie Collins' The Moonstone (1868), described by T.S.Eliot as "the first, the longest and the best of the English detective novels." Nor is it Ralph Henderson, the insurance investigator in Charles Felix's The Notting Hill Mystery1, which commenced serialisation on 29 November 1862, and which Julian Symons, in his influential 1972 study of detective fiction Bloody Murder, asserted "there is no doubt...[was] the first detective novel, preceding Collins and Gaboriau." "No doubt", that is, if one ignores the claims of M.E.Braddon's Lady Audley's Secret -- from which the above quotations are taken -- to that title. Lady Audley's Secret began serial publication in 1861 and was published in both serial and book form during 1862, some months earlier than The Notting Hill Mystery. It became a runaway bestseller and remained popular for over half a century, being filmed in 1912, 1915 and 1920. Tennyson and Thackeray were fans, and RL Stevenson told Braddon, in a letter from Samoa, "It is something to be greater than Scott, Shakespeare, Homer in the South Seas, and to that you have attained." So, why has a work which was hugely well-known in its day (that day being a very long one) never been considered a candidate for "earliest English detective novel"? It is striking how far Braddon anticipates in Lady Audley's Secret later detective novelists such as Sayers, who were credited with bringing psychological complexity and realistic character development to a genre which by the 1920s and 1930s was becoming formulaic and, ironically, bloodless. Unlike many of the works which follow it, Lady Audley's Secret features many well-drawn, vivid female characters with their own agendas, including the titular character, the antagonist. The protagonist, Robert Audley, undergoes a remarkable transformation over the course of the book. In some respects his journey subverts a common female character arc, particularly for works of the period: the spoilt, carefree young person who resists all pressure to accept adult responsibilities until forced by circumstances to do so. The ultimate reward of romantic, domestic and material happiness (symbolised by a house with roses round the porch, and an infant crawling on the lawn) is achieved only after the character has abandoned their earlier selfishness and acknowledged the need for personal change. Robert Audley is initially presented as an immensely privileged, lazily misogynistic young man. He glides through life cushioned by private wealth, high social position and a degree of emotional detachment which practically amounts to a force-field. Not even his baronet uncle's second marriage to a beautiful, penniless governess shakes Robert's complacency. He has no ambition to inherit Sir Michael's title and little sympathy with his cousin Alicia's resentment at being forced to submit to a stepmother less than five years older than she is. All this changes when Robert re-encounters George Talboys, an old school-friend (Eton, naturally). George has just returned from the Australian gold-fields desperate to be reunited with Helen, the wife his family disinherited him for marrying. The morning after George's meeting with Robert he is devastated by seeing the announcement of Helen's death in The Times. His friend's grief jolts Robert out of his detached bubble. He exerts himself to help George heal. As the first anniversary of Helen's death approaches, Robert proposes he and George visit Audley Court, his uncle's mansion in Essex, by way of distraction. On the day before their visit Sir Michael and Lady Audley are called away, leaving Alicia to do the honours. After seeing the new Lady Audley's portrait, George acts in a distracted and secretive manner. When George fails to return from a second, solo visit to Audley Court, Robert contacts George's late wife's father. The old man claims George has sailed for Australia. Robert becomes convinced George never left England; that he probably never left Audley Court, and that his uncle's new wife had something to do with his disappearance. The rest of the book deals with Robert's efforts to uncover the truth. He assumes responsibility for George's child and starts to appreciate life as seen through other people's eyes, including (most especially) female eyes. One crucial moment is when he is forced to recognise he has completely misread a woman's feelings and character because she literally dare not display any emotion in the presence of her domineering father. In fact, Robert has to become caring, involved, energetic and sympathetic -- everything he was not at the start of the book -- in order to solve the crime. Why, then, did Eliot overlook it when talking about the earliest English detective novel, and Julian Symons ignore it completely? Lady Audley's Secret has never been classed as a "detective" story, but rather as a "sensation" novel. That term has now fallen completely into disuse, so that when I used it in an historical fantasy set in 1903 members of my critique group unhesitatingly crossed out the word "sensation", assuming it to be a typo for "sensational". If the term has become unfamiliar, the genre is thriving, judging by the success of the The Da Vinci Code and its imitators. But, whether by calling something "a sensation novel" or by comparing it to Dan Brown's works, the effect is to classify it as essentially ephemeral, probably badly written, enjoying considerable commercial success but not, under any circumstances, to be classed with "real" literature, or even the more respectable genres of fiction. So, is there anything in Lady Audley's Secret which prevents it from being considered a detective novel? A detective story must have as its main interest the unravelling of a mystery; a mystery whose elements are clearly presented to the reader at an early stage in the proceedings, and whose nature is such as to arouse curiosity, a curiosity which is gratified at the end. No problems about that. The very title of the book encompasses a mystery; what exactly does the second Lady Audley have to conceal? Furthermore, in proper detective style, although the reader is led from an early stage to think they have uncovered one of Lady Audley's secrets, matters hardly end there. While the book is not structured as a pure "whodunnit", more a "whatdidshedo" shading into "willshegetawaywithit" / "canheproveit", that is not an inherent objection to a story being considered a detective novel. No-one challenges the claims of A Study in Scarlet to be a detective novel, though it can be broken down into approximately ten pages introduction and set-up; twenty-five pages of mystery, red herrings and false solutions ending with Holmes's identification and capture of the perpetrator; twenty-five pages of backstory set several thousand miles away and some years in the past; eight pages of the perpetrator explaining why his actions were justified because backstory! and also, because Mormons! and three pages of Holmes explaining how he concluded the perpetrator had done it in the first place. Even as a Holmes devotee since the age of eight, I acknowledge, structurally A Study in Scarlet is much further from Knox's ideal than Lady Audley's Secret. Furthermore, the hopelessness of trying to produce a definition of "detective novel" which puts Lady Audley's Secret on the "wrong" side and The Moonstone (let alone A Study in Scarlet) on the "right" side can be seen if one looks at the Wikipedia entry on "detective fiction" which, predictably, omits Lady Audley's Secret altogether and draws heavily on Symons. Of the above, an English country house setting (for the more conventional murder, rather than robbery), detective enquiries, a reconstruction -- though not a re-enactment -- of the crime, a final twist and "an inside job" are shared with Lady Audley's Secret. There is a "locked room" issue in Lady Audley's Secret which serves a rather different purpose to that in The Moonstone but certainly cranks up the tension. Lady Audley's Secret does not include "the least likely suspect", red herrings and large numbers of false suspects, but these are a feature of the "whodunnit" sub-genre, not required conditions for a work to constitute detective fiction. As for the skilled professional/bungling constabulary duology, this goes back at least to Much Ado About Nothing and Lady Audley's Secret is stronger for having resisted the temptation to include it. Exploration of the corrosive effect of crime, as the initial transgression sets off a train of destructive consequences both in the world in general and in the perpetrator's psyche. Given the above, one is left wondering if the "M.E." in "M.E. Braddon" had stood for "Michael Edwin" rather than "Mary Elizabeth" would Lady Audley's Secret have been pushed into the "sensation novel" sin-bin in the first place? 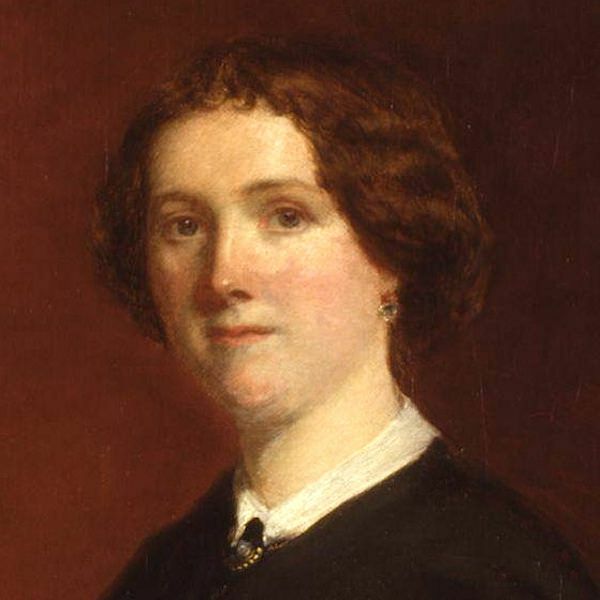 The main image used for this article is: 'Portrait of the author Mary Elizabeth Maxwell' and was used under the terms detailed at the above link on the date this article was first published.